Let me be the first to say that I am shocked this product is back, all things considered. I understand the business reasons why it would be brought to the table again, as it is a cheap product to make, and one that doesnt require a huge autograph budget to make it work. That being said, the coordination between the physical and digital team was quite poor last year, and it really killed the buzz on the initial release. Some awesome contests and fun adjustments brought the magic back, but it didnt look good for the first few days. Similarly, the physical product itself was quite ‘blah’ in 2016. Autographs fell one per three to four cases, and the redemption cards were ten times as difficult to pull as they should have been. That being said, there wasnt much to lose, as the price per box reflected how valuable a kid friendly product with a digital tie in COULD be if done the right way. Thankfully, I think we are getting closer to that with the Star Wars Card Trader physical product, and now with the Bunt product as well. This year looks to have brought more content, more redemptions and more autographs to the table, and as long as the loot cards contain some of the rare gems they did last year, I think 2017 will be infinitely better than 2016. There is one main issue. 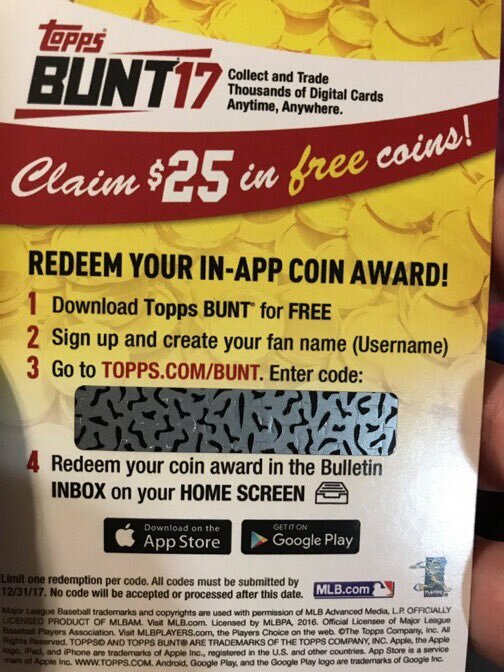 The loot cards in physical packs show that you can get 25 dollars in free coins, which I find to be relatively worthless to include in this product for existing Bunt users. Although the offer is attractive for new users, coins are easy to come by, especially with Batter Up now in the fold. From what I understand, the code cards actually do not give any coins, but rightfully give access to a loot pack, similar to the format last year. This is the RIGHT call, but the curious misprint makes things weird. It might be the offer was meant to say “a chance at” or something like that, but giving loot packs is so much more important than anything else. If the goal is to get the digital users who dont buy physical cards to try ripping real packs, the loot cards need to deliver something worth chasing. Coins are not worth chasing in that way. They are helpful, but only if the other stuff is ALSO included. As for the content, it looks like there are A LOT of cool looking cards to be had. Vapor, Splatter, and other Bunt sets from last year have been added to the product, and they look really cool. In fact, the signature cards in the physical packs look better than the signature series cards for Bunt this year, in my opinion. Its a great looking base set, and after checking out on this product early on, my mind might be changed all together. There are also a few players that I have seen making their Bunt debut thanks to these cards, including a very important Yankee who I dont think has been in the app to date. I searched for Roger Maris on all cards, and didnt see any, so this might be the first card he has. I do have a few suggestions for next year, and I would hope that they take a look if this does indeed make another run in 2018. First, there needs to be more crossover promotion. The physical world rarely ventures into Bunt territory, and for good reason. Many physical collectors hate that digital exists in their territory, and refuse to even check it out. “Why would I want photos of cards on my phone if I can have the real thing?” they say. Well, this is the opportunity to change the narrative a bit. Additionally, its time to really make an investment in linking the cards to the app. Bring some super premium content to this product, in a way that doesnt add any cost. So, im not saying you need Kris Bryant physical MLB logo patches, but why not offer some of that type of content on the digital side? How about some tickets for live signatures that might be scheduled in the future? Why not some coin cards to supplement the loot packs? Hell, this is the opportunities to bring signature series variants that are unavailable anywhere else to the fold! Give us a reason to chase the digital side of this product, none of which adds any cost to the product. As soon as the physical team embraces the true “soul” of what this should represent as a product on the calendar. Content in the loot packs and the physical packs should have super high end versions of the digital cards in place. If printing costs are increased by adding additional short printed designs, fix with generic cards that “unlock” access to a pack containing a massive hit. Either way, ill be ripping some later today, stay tuned to see a bit of what I pull. I have been following this space for the past few year and its great to see the activity for those trading digital cards. As I am also a avid collector I share the same frustrations in managing several different apps to trade and build my collection. Therefore I have decided to start my own project by creating the ideal marketplace for all collectors. I am reaching out to you all I as I want to hear some feedback and hopefully gain some support for my Kickstarter campaign. Any help or thoughts would be greatly appreciated.